Hotel rooms can now be reserved for the 2017 NSRC Respiratory Conference. Registration has been extended until May 10 for vendors who wish to sponsor the NSRC 2016 State Conference, and display booths at the event. 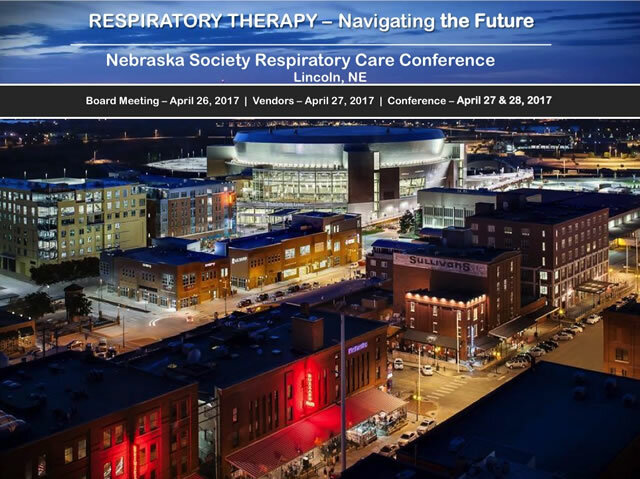 The Great Plains Conference for Respiratory Care will take place May 18-20, with vendor days being May 18-19, at the Holiday Inn Downtown, 141 North 9th Street in Lincoln. Vendors can register online to reserve their booths: https://www.regonline.com/Register/Checkin.aspx?EventID=1810703. A paper registration form is also available for those vendors who cannot register online. As an attendee you will have the opportunity to network with therapists across the state, and learn from state and national speakers. You can also participate in golf scramble on May 18, and 5K fun run/walk on May 19, while enjoying the downtown Lincoln Haymarket area.